Ingredients: Water sufficient for processing, shrimp, tuna, pea protein, coconut milk, sunflower oil, carrot, potato, dried egg, tricalcium phosphate, salt, xanthan gum, potassium chloride, tapioca starch, taurine, zinc glycine complex, choline chloride, magnesium sulfate, ferronyl iron, vitamin E supplement, niacin supplement, manganese glycine complex, selenium proteinate, thiamine mononitrate, vitamin A supplement, vitamin B12 supplement, copper glycine complex, pyridoxine hydrochloride, calcium pantothenate, riboflavin supplement, biotin supplement, vitamin D3 supplement, folic acid, potassium iodide, menadione sodium bisulfite complex. 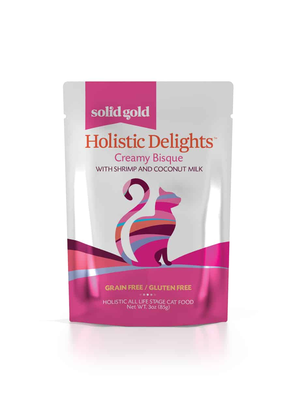 Solid Gold Holistic Delights Creamy Bisque With Shrimp and Coconut Milk is formulated to meet the nutritional levels established by the AAFCO Cat Food Nutrient Profiles for all life stages. We'll begin this review of Solid Gold Holistic Delights Creamy Bisque With Shrimp and Coconut Milk with a detailed discussion of the ingredients. Because ingredients are listed in order of pre-cooked weight, the remaining ingredients in Solid Gold Holistic Delights Creamy Bisque With Shrimp and Coconut Milk are not as important as the first five ingredients. Next we have sunflower oil. Sunflower oil is an omega-6 fatty acid source. Unlike other oils (flax, canola, etc), sunflower oil does not provide omega-3 fatty acids; However, the balancing omega-3 fatty acids are most likely supplied by another oil or fat source. The next ingredient is carrot. Carrots are an excellent source of dietary fiber and minerals. In addition, carrots are rich in beta carotene, an antioxidant which is a precursor to vitamin A. Then we have potato. Potatoes are commonly used in pet food as a gluten free carbohydrate source which also provides various vitamins, minerals, and antioxidants. Next on the list is tapioca starch. Tapioca starch is a gluten-free starch extracted from cassava roots. Starch is a necessary component in producing kibble and tapioca is an excellent choice in this regard. The next ingredient in this recipe is taurine, which is an amino acid. 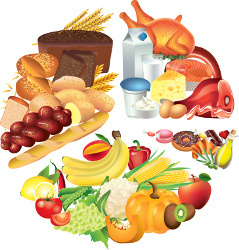 As with other amino acids, taurine is required for the proper functioning of the body. The official PawDiet rating for Solid Gold Holistic Delights Creamy Bisque With Shrimp and Coconut Milk is 2.0 out of 5.